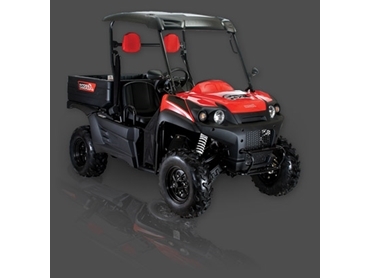 Aeon Australia introduces the Cube 4x4 vehicles, purposeful side by side utility vehicles powered by a liquid cooled four stroke petrol engine that produces the type of torque found only on much larger capacity ATVs. Driven by a CVT transmission, these 4 x 4 vehicles feature high, low and reverse gears, the low gear being ideal for steep hill climbs and when low speed is necessary for spraying. The driver and passenger are seated in comfortable seats with a car like environment. They are protected with a strong roll cage, hydraulic brakes front and rear, head rest, QH head lights, horn, and grab handles for driver and passenger. Aeon has also built these 4 x 4 vehicles with safety in mind. A large 200kg payload in a rear tilting tray with cargo hooks makes carting sprayers or any other equipment a breeze, and with their unique storage compartment under the hood and a toe hitch for a trailer getting equipment around the farm could not be easier.